* To find Cubic Zirconia earrings featuring Emerald cut and Cushion Cut stones which are impeccably framed in micropave to look like real diamonds is a precious find indeed. * Offer brides, mothers of the bride or guests at black tie affairs or galas earrings that will have the crowd certain that they were bought for thousands of dollars! * Add these Cubic earrings to your store's wholesale jewelry display and please the most discerning customers! * Mariell's 1 1/8" h x 1/2" w earrings have Emerald cut & rare Cushion cut Cubic Zirconia framed in micropave to look like real diamonds! 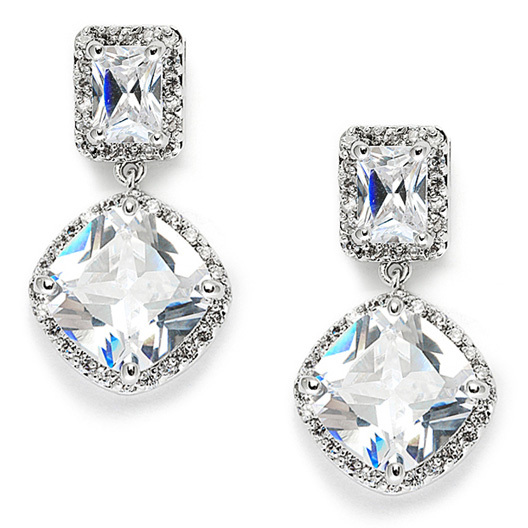 * Brides, mothers of the bride or party goers will adore these earrings that look like they cost thousands of dollars!